This name uses Spanish naming customs: the first or paternal family name is González and the second or maternal family name is Iñárritu. Iñárritu was born in Mexico City, the youngest of seven children to Luz María Iñárritu and Héctor González Gama. Crossing the Atlantic Ocean on a cargo ship at the ages of 16 and 18, Iñárritu worked his way across Europe and Africa. He has noted that these early travels as a young man have had a great influence on him as a filmmaker. The settings of his films have often been in the places he visited during this period. After his travels, Iñárritu returned to Mexico City and majored in communications at Universidad Iberoamericana, one of the most prestigious private universities in Mexico. Iñárritu began his career in 1984 as a radio host at the Mexican radio station WFM, the country's most popular rock music station, where he "pieced together playlists into a loose narrative arc". During his time in radio he also wrote and broadcast small audio stories and storytelling promos that would become a reference for generations of audio producers, radio Dj's and broadcasters as to how to use radio as a more creative media outlet. He later became the youngest producer for Televisa, the largest mass media company in Latin America. From 1987 to 1989, he composed music for six Mexican feature films. During this time, Iñárritu became acquainted with Mexican writer Guillermo Arriaga, beginning their screenwriting collaborations. Iñárritu has stated that he believes music has had a bigger influence on him as an artist than film itself. In the early 1990s, Iñárritu created Z films, a production company, with Raul Olvera in Mexico. Under Z Films, he started writing, producing and directing short films and advertisements. Making the final transition into TV and film directing, he studied under well-known theater director Ludwik Margules, as well as Judith Weston in Los Angeles. In 1995, Iñárritu wrote and directed his first TV pilot for Z Films, called Detrás del dinero, or Behind the Money, starring Miguel Bosé. In 2000, Iñárritu directed his first feature film Amores perros, co-written with Guillermo Arriaga. Amores perros explored Mexican society in Mexico City told via three intertwining stories. In 2000, Amores perros premiered at the Cannes Film Festival and won the Critics' Week Grand Prize. It was the film debut of actor Gael García Bernal, who would later appear in Babel and the Iñárritu-produced Mexican film Rudo y Cursi. Amores perros was nominated for the Academy Award for Best Foreign Language Film. After the success of Amores Perros, Iñárritu and Arriaga revisited the intersected-stories structure of Amores perros in Iñárritu's second feature film, 21 Grams (2003). The film starred Benicio del Toro, Naomi Watts and Sean Penn. It was selected to compete for the Golden Lion at the Venice Film Festival, where Penn received the Volpi Cup for Best Actor. At the 76th Academy Awards, Del Toro and Watts received nominations for their performances. Iñárritu embarked on his third film, Babel (2006), co-written with Arriaga. Babel comprises four interrelated stories set in Morocco, Mexico, the United States, and Japan, in four different languages. The film stars Brad Pitt, Cate Blanchett, Adriana Barraza, Gael Garcia Bernal, Rinko Kikuchi and Kōji Yakusho. The rest of the cast comprised non-professional actors. The film competed at the 2006 Cannes Film Festival, where Iñárritu received the Best Director Award (Prix de la mise en scène), becoming the first Mexican-born director to win the award. Babel received seven nominations at the 79th Academy Awards, including Best Picture and Best Director. Gustavo Santaolalla, the film's composer, won the Academy Award for Best Original Score. The film won the Golden Globe Award for Best Motion Picture – Drama in 2007. Iñárritu became the first Mexican director to be nominated for the Academy Award for Best Directing and the Directors Guild of America Award for Outstanding Directing. After this third feature film collaboration with writing partner Arriaga, Iñárritu and he professionally parted ways, following Iñárritu's barring of Arriaga from the set during filming. Arriaga told the Los Angeles Times in 2009, "It had to come to an end, but I still respect [González Iñárritu]." In 2010, Iñárritu directed and produced Biutiful, starring Javier Bardem, written by Iñárritu, Armando Bó Jr., and Nicolás Giacobone. The film premiered at the Cannes Film Festival in May 2010. Bardem went on to win Best Actor (shared with Elio Germano for La nostra vita) at Cannes. Biutiful is Iñárritu's first film in his native Spanish since his debut feature Amores perros. The film was nominated at the 2011 Golden Globes for Best Foreign Language Film, and at the BAFTA Awards for Best Film Not in the English Language and Best Actor. For the second time in his career, Iñárritu's film was nominated for Best Foreign Language Film at the Academy Awards; Javier Bardem's performance was also nominated for the Academy Award for Best Actor. 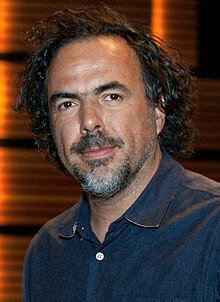 In 2014, Iñárritu directed, co-produced and co-wrote his first comedy, Birdman or (The Unexpected Virtue of Ignorance), starring Michael Keaton, Edward Norton, Emma Stone, Naomi Watts, Zach Galifianakis, and Andrea Riseborough. Birdman is about a washed-up actor famed for playing an iconic superhero who tries to revive his career by doing a play based on the Raymond Carver short story "What We Talk About When We Talk About Love." The film and Iñárritu won the Golden Globe Award for Best Screenplay, and the Academy Award for Best Picture, Best Directing, and Best Original Screenplay. Iñárritu's next film as a director was The Revenant, which he and Mark L. Smith adapted from Michael Punke's novel of the same name. The film starred Leonardo DiCaprio, Tom Hardy, Domhnall Gleeson, and Will Poulter. It is a "gritty" 19th-century period drama-thriller about fur trapper Hugh Glass, a real person who joined the Rocky Mountain Fur Company on a "journey into the wild" and was robbed and abandoned after being mauled by a grizzly bear. The film considers the nature and stresses on relationships under the duress of the wilderness, and issues of revenge and pardon via Glass's pursuit of the man who was responsible for his hardship. The Revenant took nine months to shoot. The film received "generally favorable" reviews, and was nominated for 12 Academy Awards, including Best Picture and Best Director, winning Best Director, Best Cinematography and Best Actor. It was also nominated for four Golden Globe Awards, winning three, including Best Motion Picture – Drama and Best Director, and received nine Critics' Choice Movie Awards nominations, including Best Picture and Best Director. The One Percent, originally planned as an upcoming American television drama series created and written by Iñárritu, Alexander Dinelaris Jr., Nicolás Giacobone and Armando Bó, was eventually cancelled by early March of 2017. The quartet, who also collaborated on Birdman, were to serve as executive producers. Iñárritu was set to direct the first two episodes and set the visual style of the show. A 10-episode first season was ordered by the American premium cable network Starz, though Starz then dropped the series as of the start of March 2017. From 2001 to 2011, Iñárritu directed several short films. In 2001, he directed an 11-minute film segment for 11'09"01 September 11 - which is composed of several short films that explore the effects of the 9/11 terrorist attacks from different points of view around the world. In 2007, he made ANNA, part of French anthology film Chacun son cinéma, which screened at the 2007 Cannes Film Festival. Chacun son cinéma, a collection of 34 short films by 34 renowned film directors representing 25 countries, was produced for the 60th anniversary of the film festival. [better source needed] In 2012, Iñárritu made the experimental short film Naran Ja: One Act Orange Dance, inspired by L.A Dance Project's premiere performance, featuring excerpts from the new choreography Benjamin Millepied crafted for Moving Parts. The story takes place in a secluded, dusty space and centers around LADP dancer Julia Eichten. In 2002, Iñárritu directed "Powder Keg", an episode for the BMW short film series The Hire, starring Clive Owen as the driver and Stellan Skarsgård as a war photographer. It won the Cannes Gold Lion Advertising Award. In 2010, Iñárritu directed "Write the Future", a football-themed commercial for Nike ahead of the 2010 FIFA World Cup, which went on to win the Grand Prix at the Cannes Lions Advertising Festival. In 2012, he directed Procter & Gamble's "Best Job" commercial spot for the 2012 Olympic Ceremonies. It won the Best Primetime Commercial Emmy at Creative Arts Emmy Awards and the DGA Award for Outstanding Directorial Achievement in Commercials. On October 4, 2012, Facebook released an Iñárritu-directed brand film titled The Things That Connect Us to celebrate the social network reaching one billion users. Iñárritu is married to Maria Eladia Hagerman, an editor and graphic designer. They have a daughter, Maria Eladia, and a son, Eliseo. Iñárritu has been recognized with multiple awards for his films, including four Academy Awards, two Directors Guild of America Awards, a Producers Guild of America Award, three British Academy Film Awards, three AACTA Awards, three Golden Globe Awards, two Independent Spirit Awards, two American Film Institute Awards, and three Cannes Film Festival Award. He is the first Mexican director to be nominated for the Academy Award for Best Director and the Directors Guild of America Award for Outstanding Directing, and the first to win the Best Director Award at the Cannes Film Festival. In 2015, Iñárritu won, among many other accolades, the Directors Guild Award for Outstanding Directing, the Producers Guild of America Award for Best Theatrical Motion Picture, and the Academy Award for Best Picture, Best Original Screenplay and Best Directing for Birdman, becoming the first Mexican to win three Academy awards. In 2016, Iñárritu won the Academy Award for Best Director for his work on The Revenant, marking the first time in 65 years that a director has won the award in two consecutive years. Iñárritu is the third director to accomplish this feat, following John Ford and Joseph L. Mankiewicz. In 2006, Iñárritu was honored at the Gotham Awards' World Cinema Tribute, alongside fellow Mexican filmmakers Alfonso Cuarón and Guillermo del Toro. In 2015, Iñárritu received the Sundance Institute's Vanguard Leadership Award for the "originality and independent spirit" of his films. He was also honored by the Los Angeles County Museum of Art at its Art + Film Gala. As of 2018[update], each of Iñárritu's feature films, with the exception of Amores perros, showcases at least one Academy Award nominated performance. ^ Tapley, Khristopher (October 29, 2017). "Oscars: Alejandro G. Inarritu's Virtual Reality Installation Carne y Arena to Receive Special Award". Variety. ^ Orlova-Alvarez, Tamara; Alvarez, Joe (27 February 2019). [alejandro-gonzalez-inarritu-jury-president-cannes-film-festival/ "Alejandro González Iñárritu The Jury President of 72nd Cannes Film Festival"] Check |url= value (help). Ikon London Magazine. Retrieved 27 February 2019. ^ Agencias / El Siglo De Torreón (August 15, 2014). "1963: El mundo recibe a Alejandro González Iñárritu, internacional cineasta mexicano". Elsiglodetorreon.com.mx. Retrieved February 24, 2015. ^ "Alejandro Gonzalez Iñárritu: What I've Learned". Esquire. January 12, 2015. Retrieved March 8, 2015. ^ a b c d Tobias, Scott (December 3, 2003). "Alejandro González Iñárritu". The A.V. Club. Retrieved March 8, 2015. ^ a b c d e f g h "Alejandro González Iñárritu". Encyclopædia Britannica. Retrieved March 8, 2015. ^ a b "Alejandro González Iñárritu y sus emblemáticos 3 Premios Oscar". CinePremiere.com.mx. February 26, 2015. Retrieved March 8, 2015. ^ "'Birdman' y la dualidad que todos tenemos". The New York Times. February 21, 2015. Retrieved March 8, 2015. ^ "JUDITH WESTON STUDIO FOR ACTORS AND DIRECTORS". Judithweston.com. Retrieved March 8, 2015. ^ "Cannes Prospects: 'Foxcatcher,' Inarritu's 'Birdman' Likely Headed to the Croisette". Variety. March 26, 2014. Retrieved October 21, 2015. ^ "THE 73RD ACADEMY AWARDS - 2001". Oscars.org. Retrieved 19 March 2015. ^ a b "Alejandro González Iñárritu - Biography - Songwriter, Director, Television Producer". FYI. Retrieved March 8, 2015. ^ "Sean Penn wins Volpi Cup for best actor at Venice Film..." Chicago Tribune. September 8, 2003. ^ "Oscars 2004: The winners". BBC Online. March 1, 2004. Retrieved March 8, 2015. ^ Foundas, Scott (August 27, 2014). "Interview: 'Birdman' Director Alejandro Gonzalez Inarritu on His First Comedy". Variety. Retrieved July 19, 2015. ^ "Who Is Alejandro González Iñárritu? 5 Fast Facts About The 'Birdman' Director After Academy Award Win". International Business Times. February 23, 2015. Retrieved October 27, 2015. ^ "Babel Movie Review & Film Summary (2006)". Rogerebert.com. September 22, 2007. Retrieved March 8, 2015. ^ "Iñárritu's Babel To Be Honored By 18th Annual Palm Springs International Film Festival Awards Gala". Palm Springs International Film Festival. November 30, 2006. Archived from the original on October 14, 2007. Retrieved March 8, 2015. ^ "Alejandro González Iñárritu to Receive Sundance Institute's Vanguard Leadership Award". Indiewire. January 14, 2015. Retrieved March 8, 2015. ^ a b "Alejandro Gonzalez Inarritu to Receive Sundance Institute's Vanguard Leadership Award". The Hollywood Reporter. January 14, 2015. Retrieved March 5, 2015. ^ "Film Composer Gustavo Santaolalla's Oscar-Worthy Music Studio". Variety. June 28, 2013. Retrieved March 8, 2015. ^ "Babel, Dreamgirls take top Golden Globe Awards". CBC.ca. January 15, 2007. Retrieved March 8, 2015. ^ a b Mitchell, Elvis (2014). "Alejandro González Iñárritu". Interview. Retrieved July 18, 2015. ^ a b "BIRDMAN's Alejandro Gonzalez Inarritu Wins Oscar for Best Director". BroadwayWorld.com. February 22, 2015. Retrieved October 27, 2015. ^ Whipp, Glenn. "Guillermo Arriaga tells his story". Los Angeles Times. ^ A.O. Scott (December 28, 2010). "The Mob Work Is Tough; Then He Has to Go Home". The New York Times. Retrieved May 22, 2015. ^ "Cannes Premiere: Javier Bardem Stars in Alejandro Inarritu's Biutiful". The Huffington Post. May 19, 2010. Retrieved March 8, 2015. ^ "Javier Bardem Wins Best Actor Award at Cannes Film Festival". Latin American Herald Tribune. Retrieved March 8, 2015. ^ "2011 Golden Globe Nominations Announced". Deadline Hollywood. December 14, 2010. Retrieved March 8, 2015. ^ "Baftas nominations 2011: full list". The Guardian. January 18, 2011. Retrieved March 8, 2015. ^ "Oscars 2011 Nominations List: Academy Awards Nominees". The Huffington Post. January 25, 2011. Retrieved March 8, 2015. ^ "Golden Globes: 'Birdman's' Alejandro González Inarritu, Nicolas Giacobone, Alexander Dinelaris Jr., and Armando Bo Win for Best Screenplay". The Hollywood Reporter. January 11, 2015. Retrieved March 8, 2015. ^ "Oscars: Alejandro Gonzalez Inarritu Wins Best Director for 'Birdman'". Variety. February 22, 2015. Retrieved March 8, 2015. ^ a b Fleming Jr., Mike (April 15, 2014). "Leonardo DiCaprio, Alejandro González Iñárritu Commit To September Start For New Regency's 'The Revenant'". Deadline Hollywood. Retrieved July 29, 2014. ^ a b "Leonardo DiCaprio will make his return in The Revenant". The Guardian. Retrieved June 27, 2014. ^ "Leonardo DiCaprio's Survival Drama 'The Revenant' Attracts Megan Ellison's Annapurna". Variety. July 11, 2014. Retrieved January 20, 2016. ^ Masters, Kim (July 22, 2015). "How Leonardo DiCaprio's 'The Revenant' Shoot Became "A Living Hell"". The Hollywood Reporter. Retrieved July 22, 2015. ^ "The Revenant". Metacritic. Retrieved December 28, 2015. ^ "Oscar Nominations: The Complete List". The Hollywood Reporter. January 14, 2016. Retrieved January 29, 2016. ^ a b "Alejandro Innaritu Wins Best Director Oscar For The Revenant". Deadline Hollywood. February 28, 2016. Retrieved February 28, 2016. ^ "The Revenant Wins Best Dramatic Film at the Golden Globes". The New York Times. January 10, 2016. Retrieved January 11, 2016. ^ Andreeva, Nellie (August 12, 2014). "Alejandro Gonzalez Iñárritu's 'One Percent' Gets Series Order At Starz". Deadline Hollywood. Retrieved August 12, 2014. ^ Andreeva, Nellie (March 2, 2017). "Alejandro G. Iñárritu's MRC Series 'The One Percent' No Longer At Starz, Moves Forward With Greg Kinnear As New Lead". Deadline Hollywood. Retrieved March 3, 2017. ^ "To Each His Own Cinema (2007)". IMDb. ^ "Watch: 'Trash Humpers'-Esque Experimental Dance Short Film 'Naran Ja' Directed By Alejandro González Iñárritu". Indiewire. October 26, 2012. Retrieved March 8, 2015. ^ "González Iñárritu, el director publicista GANADOR del Óscar". Roastbrief.com.mx. February 22, 2015. Retrieved March 8, 2015. ^ "Anatomy of a Cannes Winner: Nike "Write The Future"". Fast Company. June 28, 2011. Retrieved March 8, 2015. ^ "P&G Earns Praise For 'Best Job' Commercial, Innovation, Sustainability Efforts". Procter & Gamble. September 19, 2012. Retrieved March 8, 2015. ^ "DGA Awards: Alejandro G. Iñárritu Wins Best Feature Film Director For 'Birdman', TV Winners Include Lesli Linka Glatter 'Homeland' & Jill Soloway 'Transparent'". Deadline Hollywood. February 7, 2015. Retrieved March 8, 2015. ^ "Facebook runs first ad as it reaches 1 billion users". Creative Review. October 4, 2012. Archived from the original on January 6, 2015. Retrieved January 6, 2015. ^ Romney, Jonathan. "Alejandro González Iñárritu: 'When you see The Revenant you will say "Wow"'". The Guardian. Retrieved 28 June 2017. ^ "In 'Birdman,' Alejandro G. Inarritu takes his doubts and lets them fly". Los Angeles Times. 10 October 2014. Retrieved 12 July 2015. ^ "ALEJANDRO GONZÁLEZ IÑÁRRITU". Metacritic. Retrieved 21 July 2017. ^ "Amores Perros". Rotten Tomatoes. Retrieved 9 June 2016. ^ "21 Grams". 21 November 2003. Retrieved 9 June 2016. ^ "Babel". 27 October 2006. Retrieved 9 June 2016. ^ "Biutiful". 29 December 2010. Retrieved 9 June 2016. ^ "Birdman". 17 October 2014. Retrieved 9 June 2016. ^ "The Revenant (2015)". Rotten Tomatoes. Retrieved 9 June 2016. ^ "Alejandro G. Iñárritu Makes History As First Mexican With 3 Oscars: Best Movie, Best Director And Best Screenplay". Latin Times. February 23, 2015. Retrieved October 27, 2015. ^ "Alfonso Cuaron, Alejandro Gonzalez Inarritu and Guillermo del Toro". Variety. November 28, 2006. Retrieved October 27, 2015. ^ "Alejandro Gonzalez Inarritu, James Turrell to be honored by LACMA". Variety. July 15, 2015. Retrieved October 27, 2015.